Discover our new System Carousel! We proudly present you our brandnew System Carousel, a set that consists of 13 trays. The 9 trays in the middle are placed on a rotatable plexi plate. Thanks to the turning plate, this system offers you a better presentation & handling of your preparations. The dimensions of the entire system are 800 mm on 800 mm. The 13 presentation trays have different forms and 2 different depths (60 or 80 mm). 1 x R.22859: A black rotatable plate with a diameter of 800 mm and a thickness of 5 mm. This plate has 8 handles with a diameter of 20 mm and a lenght of 30 mm. 1 x R.24544: A black rotatable plate with a diameter of 800 mm and a thickness of 5 mm. This plate has 4 stainless steel handles with a diameter of 10 mm and a lenght of 100 mm. The bars in stainless steel are longer so it's easier to rotate the plate. 4 x R.22861: A black triangle plexi tray with a depth of 60 mm. The triangle has a dimension of 325 on 158 mm. 8 x R.22860: A black GN 1/5 plexi tray with a depth of 80 mm a dimension of 290 on 290 mm. 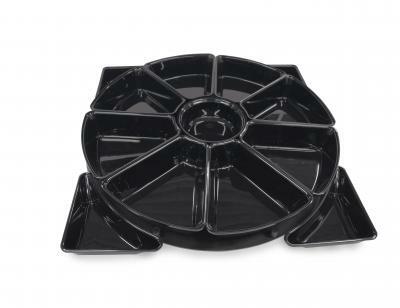 1 x R.22866: A black round salad dish with a depth of 80 mm, a diameter of 225 mm and a content of 2,5 liter. Discover the whole range of the System Carousel by clicking here!